3D Car !! 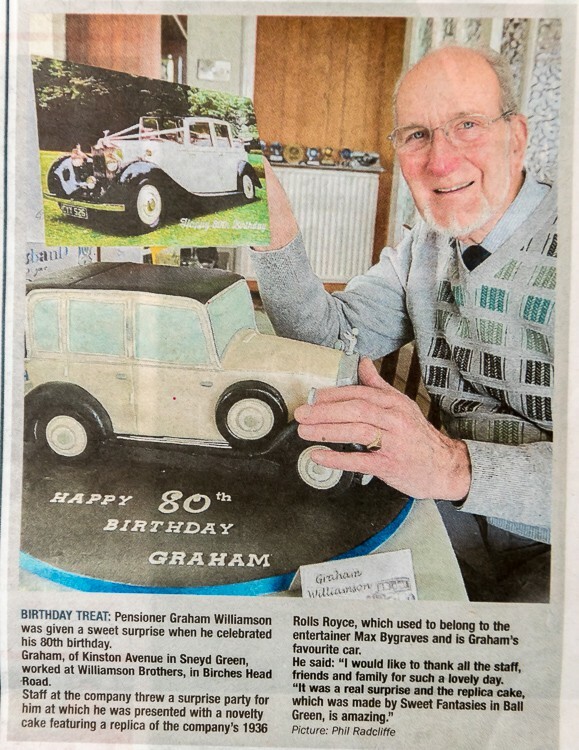 A couple of weeks ago a photo of one of our customers celebrating his 80th birthday appeared in our local paper, the photo showed Graham with is Birthday Cake a 3D 1936 Rolls Royce along with a little information about the car ( click on Photo to read the Story). The cake was ordered by his family as a surprise for him. We layered Vanilla sponge sheets together with jam and buttercream, then carved the car shape by eye. Normally we work from proper drawings or blueprints when we carve the car shape, but with this one we only had pictures that his family sent us (see below).